Is Minecraft a useful teaching tool? Researchers at SPINlab (Vrije Universiteit Amsterdam) are trying to find the answer to this question. 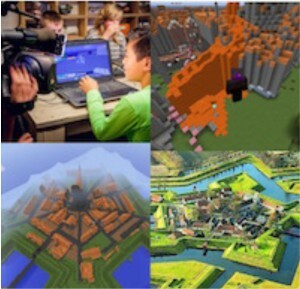 Their focus group are teachers who use Minecraft in the classroom in three Dutch schools in Lelystad, Zaandam and Amsterdam. These teachers can provide valuable feedback about whether Minecraft is an effective teaching tool. Parallel to this, the project GeoCraft NL is developed: a Minecraft world with the whole of the Netherlands on a scale 1:1. The project, initiated by the Dutch Geo Science Center GeoFort, delivers a map with all the trees, roads, rivers and buildings in the Netherlands. In this project, many public and private stakeholders participate: the 3D Minecraft objects are generated by the company Geodan using maps and public data from Kadaster and Rijkswaterstaat. All Dutch Minecraft players were asked to help finish the Netherlands in GeoCraft NL. In this webinar we invited Willemijn Simon van Leeuwen (Director GeoFort) and Mark Opmeer (PhD Student Digital Humanities at SPINLab Vrije Universiteit Amsterdam) to reflect on the GeoCraftNL project. Mark focusses his story on enriching secondary education with geo-information tools and provides useful lessons learned while implementing these tools in the school curriculum. Willemijn shares her experiences in acquainting children, parents and teachers with the fascinating world of geo and the importance and succes factors of stakeholder involvement. This webinar is moderated by Dr. Niels van Manen, Coordinator UNIGIS Amsterdam. Although there is a geo-ict focus in every webinar topic, you don’t necessarily have to be familiar with geo-ict. These webinars target a broad audience. The webinars are free to attend.